- Click Map for FULL Version ! 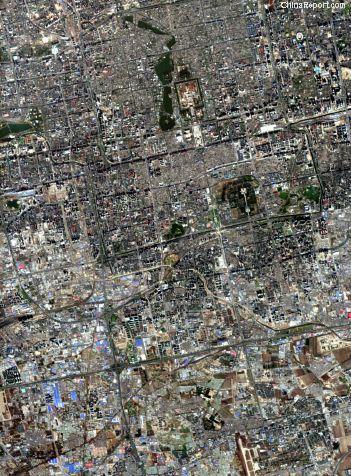 the Former Imperial City of Beijing, thus forming an important and visible boundary within the City. The Dong'An Gate formed the ultimate border between what was known as the Tartar City and the Imperial City. 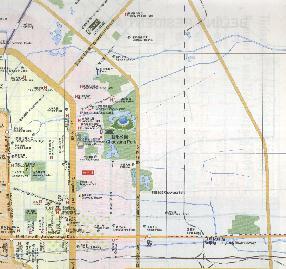 The first being the exclusive neighborhoods inhabited exclusive by Manchu's within the City of Beijing (the districts north of Qianmen Gate), the latter being an even more restrictive zone and the exclusive realm of the ruling Elite, Manchu Nobility and naturally, the members of the Imperial House. 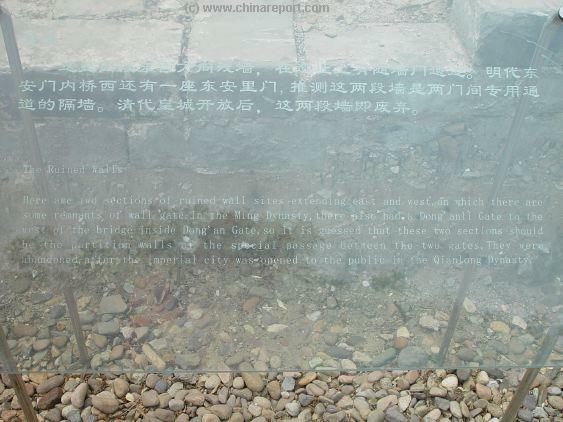 To be clear: within the Imperial City lay another ″city″, which was the ″Great Within″, the Imperial Palace itself, better known as the Forbidden City today. Overview of the Dong An Gate ruins historic site near the current East gate - Dong Hua Men (East Flowery Gate) of the Palace Museum (a.k.a. Forbidden City). during the so-called ″Boxer rebellion″ (1900 AD - 1902 AD). Thus, the Professor became one of the first of many unfortunate and often defenseless victims of Chinese outrage at Colonial excesses and the ever-rising European and western influence in the China of that day. the Dong 'An Gate - Dong meaning East - is situated within the Dongcheng District. In fact, due to the symetrical design of the Imperial Palace and all its layers, the Dong 'An Gate was placed exactly on the line extending from the current eastern gate of the Imperial palace (Museum)(Forbidden City), known as Dong Hua Men (East Flowery Gate), and situated but a city block further to the East. 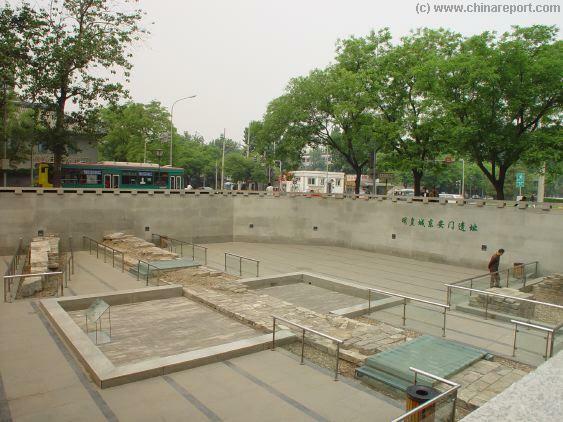 Although many visitors to the Palace Museum flock by daily, and busses offload at the East Gate, the Dong 'An gate ruins site is usually overlooked by the far majority. For the better informed however, the Dong 'An Gate is situated on a perfect spot and can be easily included in a fun historic hiking tour of the Palace Museum and immediate area. There are several routes to choose from each incorporating various places of interest, including some hidden historic landmarks. The Palace Museum - Inner & Outer Imperial Palace Perimeter Map, A unique satellite image overview of the Palace Museum Perimeter and the greater Imperial Palace Area. 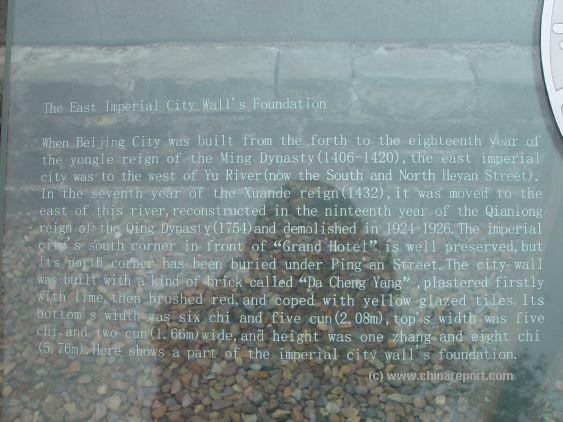 As described in the adjacent text, structures of Dr. Sun Yat-Sen Park, the Park of the Peoples Culture and the Imperial Ancestral Shrine were a a part of the larger Palace City. Find NanChiZi Dajie' running North-South along the East of the Palace, where the Imperial Library Vault is still located and open to visits. Air Raid shelter sign found in the green zone which also includes Dong An Gate ruins exhibit. short walk east of the current East Gate, the ruins themselves being not easily spotted as they are situated in a pit inside a small green zone. The green zone itself is clearly identifiable from some distance by the large signs pointing the way to a local air raid shelter. 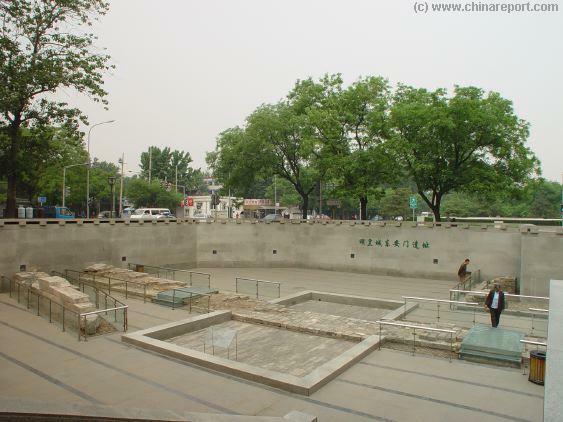 The air raid shelter is not part of Beijing's historic and somewhat legendary underground city air raid shelter labyrinth, but is a fully modern facility built at a later date. 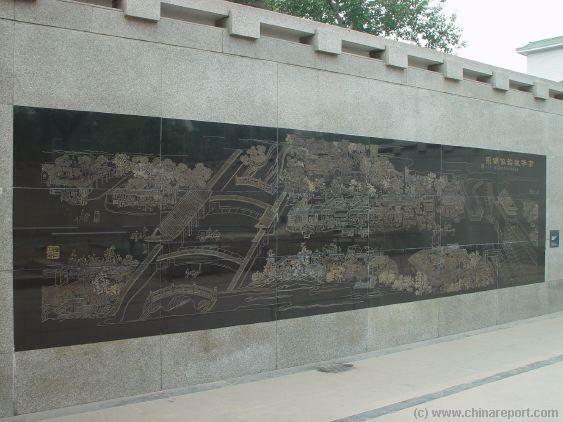 For first time vistors to Beijing City a good route to take to end up at the Dong 'An Gate ruins is to simply find your way to the main south gate of the Palace Museum. 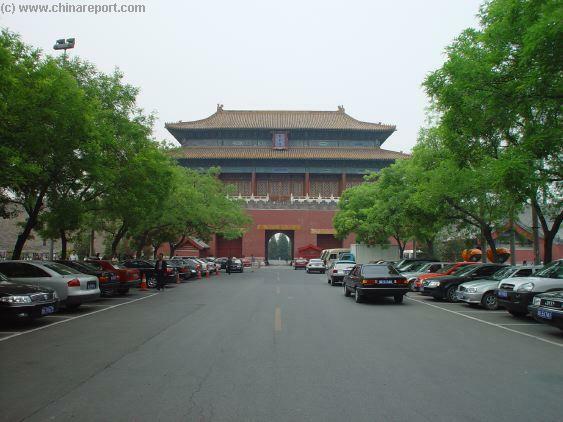 This south entrance gate is known as the Wu Men (Meridian Gate) and it is situated north of the famous Tian 'An Men (Gate of Heavenly Peace) at Tiananmen Square. Donghuamen, eastern gate, already a worthwhile walk in itself. After making a stop-over to admire the Eastern Gate, one can head out in the eastern direction (the only route available) to end up at a busy and tree lined inter-section. This is the intersection of Chizi Dajie - leading away as NanChizi Dajie to the South and BeiChizi Dajie to the North, and the Donghuamen Road (Donghuamen Dajie) leading away further eastward. 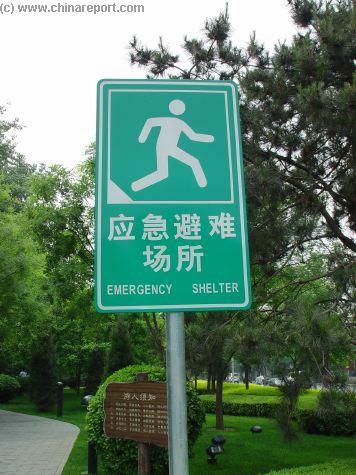 Follow Donghua Men road to inevitably end up at the Dong 'An Gate. Although not clearly visible from the road, the Dong 'An Gate ruins site is situated on the north-east side of intersection from Donghua Gate. Head into the green to discover the pit, ruins and some explanations. 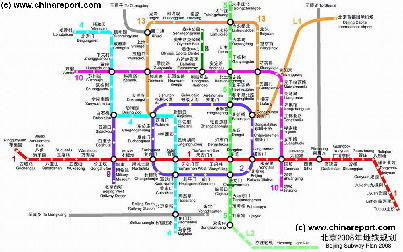 The best alternative route, which is probably the quickest, and the easiest understandible route to take, is to start out at the Beijing Hotel and Grand Hotel Beijing. The Imperial Library, a stone structure hidden behind Imperial Purple Walls is a good place to visit on your way to the Dong 'An Gate. It is yet another structure affiliated to the current Palace with its own peculiar historic significance. After browsing around at the (former) Imperial Library to get a taste of the past and glimpsing some of the future at its Wanfung Modern Art Gallery, the next stop northward up the road is the Chizi Street-Donghua Men Road intersection where one can turn right- and eastward to find the Dong 'An Gate ruins just 1 block away. Naturally, from Dong 'An Gate ruins one can easily extend to hike, and reverse route 1 to include the exterior of the Forbidden City walls in your route. 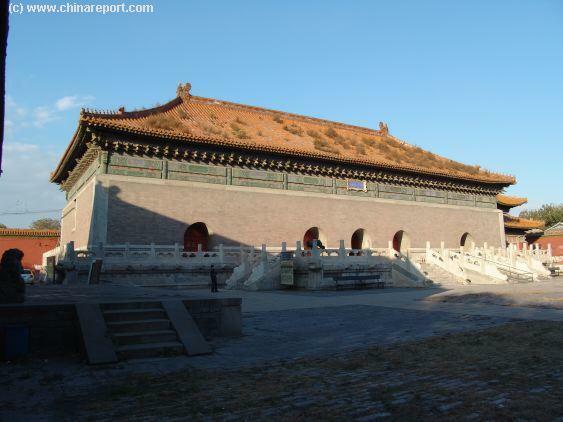 You will end up at the main south gate to the Forbidden City, the earlier mentioned Wu Men - Meridian Gate, ready to buy your ticket and see the once forbidden interiors of the Emperors' Palace. 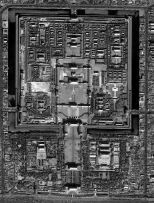 Satellite Image overview of the Old Central City of Beijing, clearly showing the location of former borders and the central location of the Palace (Museum). The Dong An Gate is found on the East (right hand flank) of the Palace proper. A snowcapped The Wu Men - South Gate of the Palace Museum and its large courtyard in November 2005. 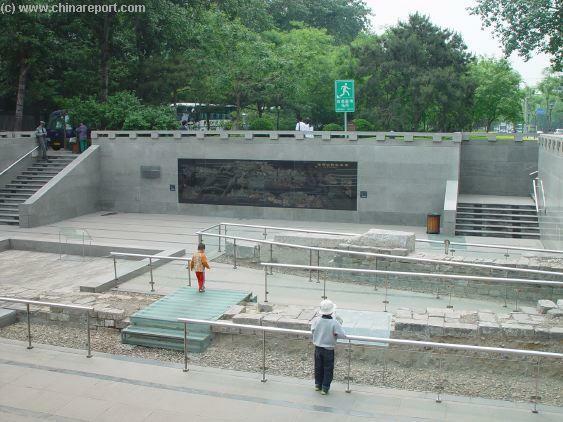 View of the Donghua Men, the current East Gate of the Imperial Palace and complex which was the boundary between the exclusive home and Palace of the Emperor, and the Imperial City which surrounded it. The Dong An Gate served as yet another gate, which divided the Imperial City from the Tartar City. The Tartar City was seperated from the 400 million Chinese populace by yet another wall and gates. Hence, the Emperos Home was placed as box in a box in abox, and so forth. hit the Wanfung Modern Art Gallery , one of Beijings Finest, while you go. Full Google powered Map of the Dong An Gate ruins site and surrounding area. Street, marked by the massive Dongdan Plaza Malls, head westward along this road. Way beyond the clearly identifyable Wanfujing Night Market, lies another popular tourist stop-over the Donghua Men, Eastern Palace Gate. Make your way in a straight line and move past Donghuamen Night Market to end up at the intersection of Chizi Dajie and Donghuamen Road to find the Dong 'An Gate again. Naturally, this route can also be reversed, varying your hike according to interest and desire. East gate of the Tartar City. On 19 June of 1900 AD the Chinese Government ordered the foreign ministers in Peking to leave the country within 24 hours. For their part, the Chinese probably feared the invading militaries would become occupation forces, and the Empress undoubtedly believed that, in order to maintain power as the leader of the weakening Qing (Manchu) Dynasty, she had to support the increasingly popular uprising against foreign aggression. Unfortunately, the natives elected to compound the disturbance through violence. German Minister Baron von Ketteler was murdered by a Chinese official the next morning (20 June), and the foreigners elected to “hunker down” rather than risk being slaughtered in an attempt to reach the border without protection. The following day British professor Hubert E. James was captured and decapitated. His head was hung proudly from one of the Tartar Wall gates. China then declared “war on the world,” officially backing the Boxer movement and throwing her own troops against the foreigners trapped in Tientsin and Peking—and against the surrounded Seymour expedition. Oether version: captured the elderly Prof. Hubert James, tortured him for three days, then cut off his head and impaled it on a spike as a gruesome display..
And what happened to Professor James, whose death was presumed but not actually witnessed, when he was attacked by Imperial soldiers?